Facilities: FCI Cumberland and an adjacent minimum security satellite prison camp. 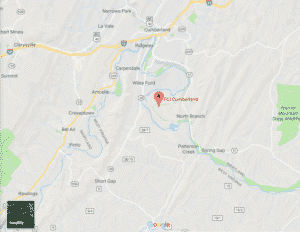 Location: FCI Cumberland is located In western Maryland, 130 miles northwest of Washington, D.C.
Background: FCI Cumberland was opened in 1994 and has a license plate manufacturing center, where inmates produce license plates used on federal government vehicles. Notable inmates include leader of the Virginia jihad network Masoud Khan (serving a life sentence for seditious conspiracy), former US Army doctor Jeffrey MacDonald (serving a life sentence for murdering his wife and two children), boss of the Lucchese crime family Vittorio Amuso (convicted in 1992 of racketeering), and lobbyist Jack Abramoff (served 42 months for fraud, tax evasion, and conspiracy). Housing: Inmates are housed in two-person and three-person cells. Inmates at the camp are house in dormitories. Health Services: All inmates at FCI Cumberland receive a physical examination within 14 days of arrival. A complete physical examination is required for inmates who are out of BOP custody for more than 30 days (e.g. furlough, writ, or Residential Re-entry Center failure). Periodic health examinations including age-specific preventive health examinations (e.g. cancer screening) for the inmate population are provided at the Clinical Director’s discretion. Other health services include sick call, chronic care management for chronic and infectious diseases through enrollment in chronic care clinics for regular care, routine dental care, medical and dental emergency care for injuries and sudden illness, medications, age-appropriate preventive care to promote optimal health and functional status, restorative care to promote achievable functional status, long-term care and end-of-life care. Additional treatments may be available depending on staff referrals. Psychology Services: FCI Cumberland offers screening, assessment, and treatment of mental health problems, individual and group counseling, psychoeducational classes, self-help and supportive services, along with referral to Health Services for medical treatment of a mental illness. Groups for anger management and stress management, as well as crisis intervention, are available. Residential Drug Abuse Program (RDAP): Both FCI Cumberland and the satellite camp offer a Residential Drug Abuse Program (RDAP). The facilities also offer a Drug Education Course and the Non-Residential Drug Abuse Program (NR-DAP). Education Services: FCI Cumberland offers GED and English-as-a-Second Language (ESL) programs. Classes are separated into Advanced GED, pre-GED, and Special Learning Needs levels. Parenting, Pre-Release classes, the Hope House Book Reading Program, and employment preparation classes are available. High school diplomas and post-secondary programs are available through paid correspondence programs. Advanced Occupational Education: FCI Cumberland offers advanced occupational education in Carpentry and Drywall. The camp offers programs including Dog Trainer, Pet Grooming, and Veterinary Assistant. Vocational Training: FCI Cumberland and the satellite camp do not offer any vocational training aside from the advanced occupational education and apprenticeship programs. Apprenticeship: FCI Cumberland offers apprenticeships in Baker, Carpentry, Maintenance, Peripheral Equipment Operator, Cook, and Electrical Maintenance. The camp offers Automobile Mechanic, Computer Peripheral Equipment Operator, and Powerhouse Mechanic. Both facilities offer apprenticeships in Cook, Electrical Maintenance, Heating, Ventilation and Air Conditioning, Landscape/Gardener, Painter, and Welder Fitter. Library Services: FCI Cumberland Inmates are provided access to legal materials through the TRULINCS Electronic Law Library where they can prepare legal documents. Inmates can also check out newspapers, magazines, and a wide variety of nonfiction and fiction books. UNICOR: The FCI Cumberland UNICOR produces signs and license plates used on government vehicles. Commissary: Inmates are permitted to spend up to $360.00 per month. Inmates may use funds in their account to purchase items at the institution commissary, place funds on their inmate phone account, purchase TRU-Units for their TRULINCS account, or send funds out of the institution. Inmates shop by completing a commissary form with their selections, submitting the form, and then using a laundry bag to carry their purchases back to their housing unit. Recreation Services: FCI Cumberland provides physical fitness and leisure programs. Leisure activities include organized and informal games, sports, physical fitness, table games, hobby crafts, music programs, intramural activities, social and cultural organizations, and movies. Art activities include paintings and sketches rendered in any of the usual media (e.g., oils, pastels, crayons, pencils, inks, and charcoal). Hobbycraft activities include ceramics, leatherwork, models, clay, mosaics, crochet, knitting, sculptures, and woodworking. Wellness programs include screening, assessments, goal setting, fitness/nutrition prescriptions, and counseling.